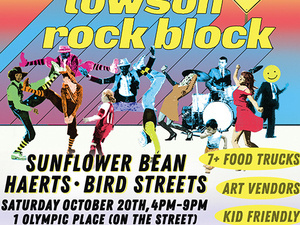 Get ready for the 2nd annual WTMD Towson Rock Block, presented by Fidelity Investments! On Saturday October 20th, the street in front of WTMD will be closed down for an afternoon of family friendly music, food, art vendors, beer and fun. Brooklyn based Psychedelic rock trio Sunflower Bean. The dynamic bi-coastal blends from Bird Streets. And the German indie pop duo HAERTS.